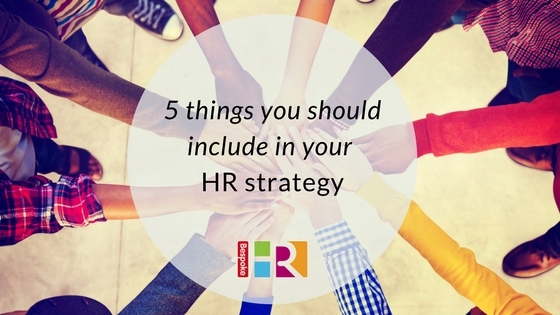 Whether you employ five people or 50, in order to attract and retain the best staff you will need a robust HR Strategy. It doesn’t have to be complex or lengthy, but should always cover these five key elements. Employee satisfactionMake sure you consider how you will measure this, and which mechanisms you will put in place to increase your employee satisfaction levels. Training and developmentInclude a comprehensive plan which clearly outlines how you will train and develop every member of staff. Set aside a training budget which takes into account the varying needs of your employees and levels of seniority. What is right for your business, proactive or reactive HRConsider whether you want to deal with HR challenges as and when they happen, or whether you need to anticipate and plan for organisational change. This will vary depending on the nature of your business, but often a combined strategy is a good idea to give you peace of mind. Good recruitmentIt may sound obvious, but make sure you have the right tools in place to ensure you recruit effectively and follow the correct processes. Getting this right from the very beginning will ensure you recruit the very best people. Don’t go it alone, there are various options open to you from getting external HR consultants (like us) to help, or using specialist recruitment agencies who can vet applications, leaving you to get on with your business. Work flexibilityHave you considered offering a flexible working policy? Increasingly, employees are looking for flexible working options, and offering this could give your company the edge over competitors in recruiting top quality staff. According to training organisation Digital Mums, a shocking 70% of women leave the workforce because they find it impossible to combine their career and family life. Recruitment campaign Hire Me My Way claims that “less than 1 in 10 job adverts offer flexible working.” Get ahead of the game and think about this could fit into your company culture. Get in touch for advice on preparing your HR strategy.